Perhaps our most important stewardship of all is the stewardship of the gospel. As Jesus Left this earth, he gave his disciples and his church this instruction: “Go therefore and make disciples of all nations, baptizing them in the name of the Father and of the Son and of the Holy Spirit, teaching them to observe all that I have commanded you. And behold, I am with you always, to the end of the age” (Matthew 28:19 – 20). When you read the early history of the church in the book of Acts and when you read the New Testament epistles, you can’t help but see how seriously Christians took this charge. They understood that God had made them stewards of the good news of Jesus Christ. And they gave all they had to ensure they were good and faithful stewards. It is because of their faithful stewardship that the gospel spread through the years and the generations until it spread to me and to you. 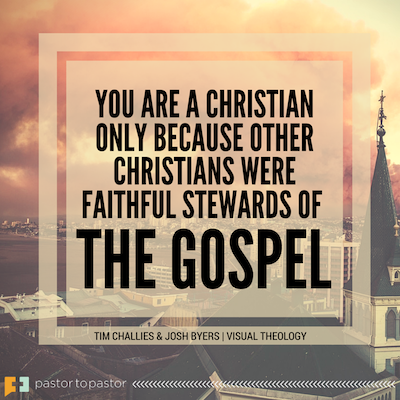 You are a Christian only because other Christians were faithful stewards of the gospel. You faithfully steward the gospel when you protect it and when you spread it. You protect the gospel by growing in spiritual health and maturity. Paul told his young protégé Timothy to “guard the good deposit entrusted to you” (2 Timothy 1:14). Paul told Timothy that, as a Christian, he was responsible before God to understand, believe, and protect the gospel. That is true of you as well. The more you know of God and his gospel and the more you know of the Bible and of Christian doctrine, the greater your ability to identify any deviations or counterfeits. The call to grow in health is not only a call for you to do what is best for you, but a call for you to do what is best for others. The gospel is always under attack and the more you know of it, the greater your ability to protect it. You also protect the gospel by spreading it. There might be a temptation to guard the gospel by locking it up and sealing it away, but the better way is to spread it so much that it becomes impossible to stop. Just think of how the Bible spread. If there had been one Bible and it had been kept under lock and key, it would inevitably have been lost to history. Instead, Christians diligently copied the Bible. Sometimes they copied an entire book in beautiful scrolls, and sometimes they copied a verse or two on little scraps of parchment. But they copied it so often that today we have tens of thousands of source documents that enable us to reasonably reconstruct the original. We have such confidence in the Bible exactly because it spread so far so fast. And the gospel functions much the same. We guard the gospel by spreading it, by proclaiming it to everyone we encounter. The farther it spreads, the more difficult it is to twist it or lose it. So spread that gospel to everyone you encounter — your family first, your friends, your neighbors, your coworkers, and even outright strangers. God means to glorify himself by and through the gospel. We are God’s plan for accomplishing that. He has no backup. He means for the good and pure gospel to spread from one person to another until it has spread over the entire earth. Christian, this is God’s charge to you. He has given you his gospel and called you to steward it. Will you? Do you need to make deep truths of the Bible more accessible to a small group or Bible study? Use this image-rich book in your groups and people will experience the truth in a new way: they won’t just read the truth, they will see the truth. Click below to view a free infographic selected from Visual Theology. Then order the book today so you can share more Visual Theology with your group.